Razer is no stranger to feature-laden and often bloated software suites powering its PCs. 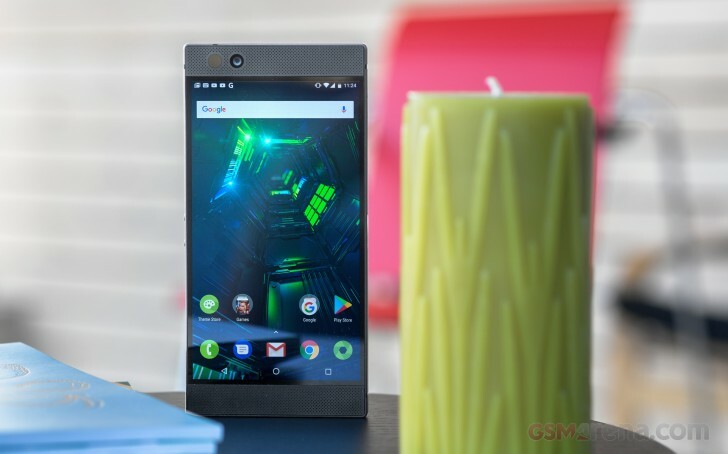 Frankly, we expected to see something similar with the Razer Phone, but, thankfully, that's not exactly how things played out. In a pleasant turn of events, Razer actually went for a near stock ROM on its ambassador Android device. The handset runs a surprisingly clean Android 7.1.1 Nougat ROM, with a very minimal app package on top. It is good to see that Razer oriented itself quickly in the Android realm and the performance benefits of a bloat-free OS. However, the Razer also found a nifty way to stay true to its roots and deliver all the "swag" its fans have grown accustomed to, without too much bloat. The solution in question is a custom Nova Launcher Premium install, that ships with every Razer Phone by default. The latter opens up a tremendous amount of UI customization options. You can pretty much tweak every part of the UX to your liking. For instance, out of the box, the Razer Phone, uses a Pixel-Style up swipe gesture to enter into a vertically scrolling app drawer. After a few clicks, we were able to remap that gesture to something more relevant to us. For instance, bringing out a classic app drawer icon, or switching to a horizontal layout in the app list or even tweaking the appearance of the notification badges and the transition animations. The sky is the limit with the Nova launcher and it's no wonder it is still one of the most popular custom launchers out there. Plus, Razer worked with the Nova team to sprinkle in some extra "swag" of its own as well. There is a powerful Razer theming engine running on top of Nova. Just fire up the Themes app and browse a selection of well crafted themes, courtesy of Razer themselves, absolutely free of charge. Besides tweaking the usual things, like wallpapers and icons, these actually change some color accents deep within the UI itself, like the notification shade. Most default Razer apps change their color scheme accordingly as well. The selection is still quite limited, but the themes that are already present are all really high quality and either gaming-inspired or Razer-themed, which fans are likely to appreciate. The legendary Razer Toaster gag even has its own theme - a natural first choice for us. So, since most of the look and feel of the Razer UI is subject to some form of tweaking and entirely up to you, there is no real point in touring most basic controls. As already mentioned, you can setup the app drawer any way you like it, the same goes for the desktop, gestures and optional Google Now pane. The notification shade is a pretty Vanilla Android affair. Well, minus the color customizability previously mentioned, that is. One swipe down for notifications and another or a two finger one for the quick toggles. These can be rearranged freely. One toggle in particular seems to stand out - DOLBY. The pair of powerful stereo, front-facing speakers on the Razer Phone are THX certified and powered by DOLBY ATMOS technology. The latter threw its own equalizer software in the mix, complete with custom profiles. You can quickly switch between these from the DOLBY quick toggle. Most other aspects of the Razer Phone UI are stock or almost nearly so as well. This includes the app switcher and most of the main settings menu as well. Split screen is supported. Besides the equalizer, there are only a couple of other noteworthy custom additions to the settings menu. Game Booster is one of them. It actually serves as a complementary feature to the resolution and refresh rate adjustment controls, found in the Display menu. Yes, they are two different types of controls, for some reason. Anyway, Game Booster lets you set resolution, refresh rate for the panel and a CPU frequency cap for each app, individually. While definitely a nifty idea, we would note that mucking about with these settings didn't really yield any fps improvements in most games we tried. Plus, for some reason, these controls seem to work independently of their OS-wide counterparts and some games are not particularly happy about that. Certain titles get mixed up quite a bit, for instance, running in 720p mode in a small window in the top left part of the phone screen, which, itself is retaining the QHD resolution set in the Display menu. We ran into other similar issues as well, so the feature clearly needs some extra work, not to mention proper third-party support. But, there is only so much Razer can do about that. Just to finish the tour up, the ominously titled "Razer Preferences" menu currently only holds a usage statistic reporting toggle. Rather anticlimactic. Also, browsing through the developer menu of the Razer Phone, we found a nifty little on-screen fps counter, which Razer likely implemented for proper gaming performance monitoring and debugging. It definitely came in handy while measuring performance and on screen frame rate. Hop on over to the next page to see our findings.